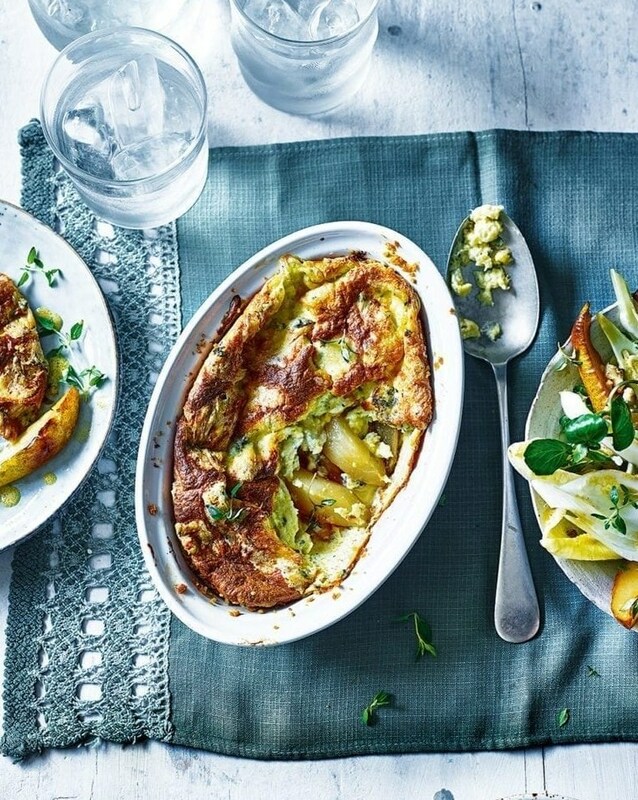 Sweet roasted pears complement the salty melted blue cheese in this savoury soufflé recipes. Serve with a bitter leaf salad for an elegant lunch, or dinner party starter. Sprinkle breadcrumbs into the greased baking dish, turning to coat the inside. Heat the oven to 200°C/180°C fan/gas 6. Put all the pear slices in a frying pan over a high heat with 25g of the butter, the sugar, a splash of water and the thyme. Bring to the boil, then lower the heat slightly and cook for 15-20 minutes or until soft and caramelised. Season with smoked (or ordinary) salt and ground black pepper. Set aside to cool a little. Meanwhile, heat the remaining butter in a pan. When it foams, stir in the flour and cook for 3-4 minutes, stirring with a spatula, until it smells biscuity. Take the pan off the heat and beat in the warm milk until smooth. Simmer gently for 3-4 minutes, stirring until smooth and thick. Remove the pan from the heat and mix in the egg yolks and half the blue cheese. Put half the pears (a mix of peeled and unpeeled) in the prepared dish. In a clean mixing bowl, whisk the egg whites using an electric hand mixer until they hold medium-stiff peaks. Mix 1 tbsp of the egg white into the egg yolk mixture to loosen it, then gently but briskly fold in the remainder using a metal spoon. Pour into the dish and top with the remaining cheese. Bake for 18-20 minutes until puffed up but with a slight wobble. Meanwhile, toss the salad ingredients with the remaining pears. Whisk the dressing ingredients, drizzle over the salad and season with black pepper. Serve the soufflé immediately, sprinkled with the extra thyme, along with the salad and some crusty bread if you like.